The excitement of making a quilt the proper way, from scraps, is the balance between accuracy and ingenuity. The aim is to create beauty of expression with economy – even frugality – of means. I was inspired by the patterns and creativity of Amish and Gee's Bend Quilt makers. 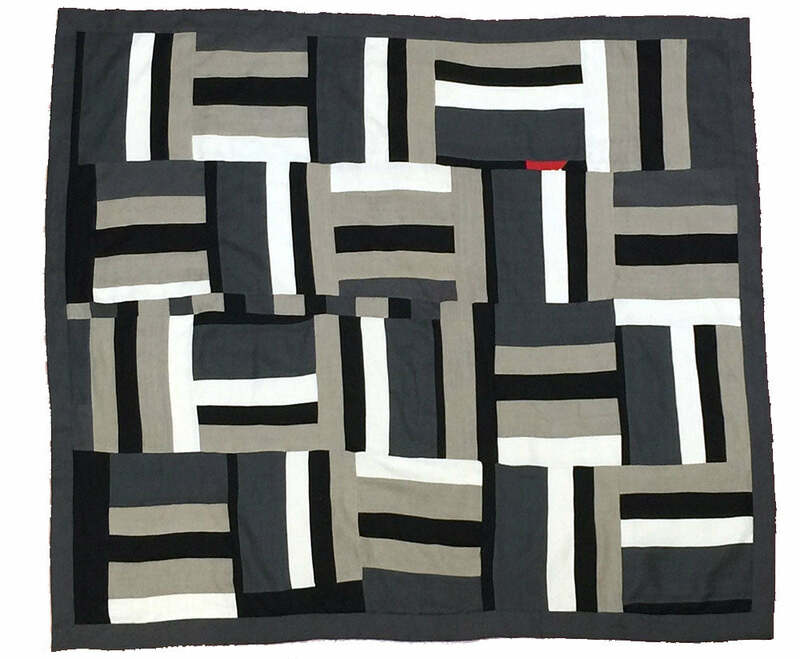 A lot of work goes into making these quilts – no two are ever the same. Their charm comes from their irregularity, emerging naturally from availability of fabric, the ingenuity of putting it together and the simplicity of the material, by dint of skill and effort making something beautiful, something collectible. Material: 100% Linen. Mix of "Orkney" and "St. Barts". Smooth backing. This throw contains Charcoal, Black, White, Natural, and a flash of red. The tufting is also red, on a pieced smooth linen lining with cotton fill. This quilt is lighter in colour with St. Barts aqua, Orkney natural and white, with a flash of rust. Tufting is natural, on a pieced smooth linen lining with cotton fill. Great. Though I wasn't expecting to have to pay duty when shipped to me in Canada ( an additional $100 approx). Love the product. In addition to using it on its own, I also use it on top of the Summer Sheet for sleeping - creates a comfortable weight. Thanks. You have done it again with this lovely addition to your linen creations. When I unfolded the quilt after removing it from its protective case I could only say, ���OMG, this is sooo beautiful���. I love, love, love it. 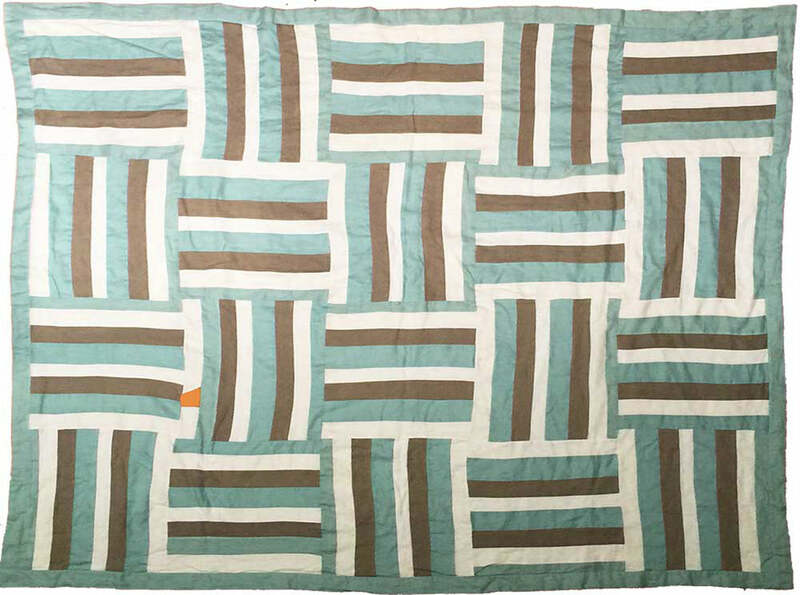 The quality of this quilt is superb, the weight is perfect for cool nights and the layout of the strips makes a lively presentation that brightens my room. I was hesitant to pay this much for a bed quilt, but having received it I must say, it is worth every dime and I���m so happy that I purchased it. You have done it again with this lovely addition to your linen creations. When I unfolded the quilt after removing it from its protective case I could only say, “OMG, this is sooo beautiful”. I love, love, love it. The quality of this quilt is superb, the weight is perfect for cool nights and the layout of the strips makes a lively presentation that brightens my room. I was hesitant to pay this much for a bed quilt, but having received it I must say, it is worth every dime and I’m so happy that I purchased it. This quilt is so lovely. I purchased the queen seaside. The photos on the website are beautiful, but, they are really amazing in person. The workmanship on this is unbelievable. No detail is apparently too small for Tricia to see to. I have the blue summer cover and sham covers and they match perfectly. It is the perfect weight for cooler summer nights and I'm sure it will take me into fall before I switch over to my Rough Linen duvet covers. I put it on my bed sideways so that it's longer on the sides, and with the pattern the way it is, it doesn't matter. I highly recommend this quilt and all of Rough Linen's products. You will not be disappointed. I feel like Linus with his blanket re my quilt. I carry it to the sofa for a quick nap, to the chair for reading and drape it over the bed just to admire its beauty. Yesterday, an artist friend dropped by and was admiring the fabric, the beautiful work and design. We sat and watched many videos on your site and the Philip Johnson "Glass House" was especially a big hit. P.S. In time I will send some photos of the linens being put to use in my home, which is the total opposite of Philip Johnson's minimalism! The lovely photos from customers, displaying their homes and linens, were a joy to behold. It was wonderful fun to see the varied looks, each a beautiful reflection of the occupant. There was not a "bad" one in the bunch!